Hausa language, the most important indigenous lingua franca in West and Central Africa, spoken as a first or second language by about 40–50 million people. It belongs to the Western branch of the Chadic language superfamily within the Afro-Asiatic language phylum. 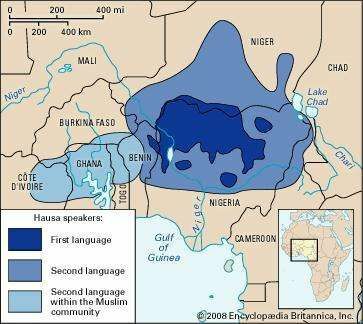 Distribution of the Hausa language. Encyclopædia Britannica, Inc. The home territories of the Hausa people lie on both sides of the border between Niger, where about one-half of the population speaks Hausa as a first language, and Nigeria, where about one-fifth of the population speaks it as a first language. The Hausa are predominantly Muslim. Their tradition of long-distance commerce and pilgrimages to the Holy Cities of Islam has carried their language to almost all major cities in West, North, Central, and Northeast Africa. The basic word order is subject–verb–object (SVO). Hausa is a tone language, a classification in which pitch differences add as much to the meaning of a word as do consonants and vowels. Tone is not marked in Hausa orthography. In scholarly transcriptions of Hausa, accent marks indicate tone, which may be high (acute), low (grave), or falling (circumflex). Hausa morphology is characterized by complex alternations of sound and tone sequences. Like other Afro-Asiatic languages, Hausa has a rich “root and pattern” system in which “patterns” of vowels are interlaced with and provide specific meanings for consonantal “roots” (denoted by the Square root of√ symbol) that indicate a general concept. In the interaction of roots and patterns, certain consonants “weaken” or change under some circumstances. Variations in tone, vocalic, and consonantal forms are illustrated by the constructions associated with the root for ‘bush cow,’ *Square root of√ ɓkn (the asterisk * denotes a reconstructed term). In the singular form, ɓáunáa, the /k/ of the root weakens to become the vowel/u/. However, it remains as /k/ in the complex plural form ɓák-àa-n-ée, which includes the infix -aa-between the final and prefinal consonants, plus the suffix -ee-. In these examples, the singular form has the tone pattern High-High (H-H), while the complex plural form has the tone pattern High-Low-High (H-L-H), which always occurs with this plural formation type. Nouns are marked for both number (singular or plural) and gender (masculine or feminine, which are marked only in the singular). 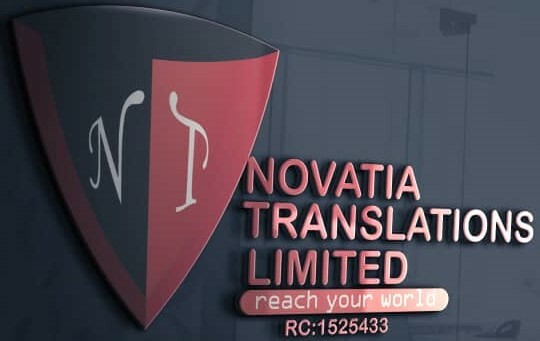 New words can be created from both nouns and verbs through a process known as derivation. For instance, the verb stem haif- ‘to procreate, beget, give birth’ can yield the formation of agentive and locative nouns by means of a prefix má-, different vocalic endings, and diagnostic tone patterns. Contrast má-hàif-íi ‘father’ with má-háif-ìyáa ‘mother,’ má-hàif-áa ‘parents,’ and má-háif-áa ‘birthplace, womb.’ Note that the words for ‘parents’ and ‘womb’ differ only in the tone melody across the word: H-L-H versus H-H-H.